Via Daily Meh, here's a frustrating story of a town in Britain trying to get a business owner to remove some graffiti which his was completely okay with. A piece of street art by an internationally renowned artist could be painted over after a council deemed it a blight on the local environment. 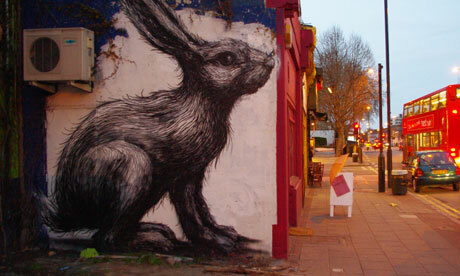 ROA, a secretive Belgian street artist who, like Banksy, has showcased his work in east London, painted a 3.5m (12ft) rabbit on the side of a recording studio in Hackney last year. The building's owners had granted the artist permission to create the piece, but they have been served with a removal notice by Hackney council, warning that unless they "remove or obliterate the graffiti" within 14 days, a council contractor will paint over the wall and charge them for the service. "It's quite the opposite of what they're saying it is," said Julia Craik, managing director of Premises music studios and cafe. "It's not a blight – it really adds to the local area. "If it was some horrible graffiti then they'd have a point, but it's a thing of beauty in Hackney Road, which is not the greatest area in the world. Among the bingo halls and shops you've got a really nice artwork, which really adds something." Yeah, better take that down right away. UGLY.